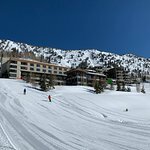 I just returned from my 4th annual "guys ski trip" to Alta and the Rustler Lodge and our affection for the place and the people there keeps on growing. The personal service says it all: on the first day of our first visit four years ago the guy at reception offered to lend me his personal ski pants and jacket when he heard the airline had lost my luggage - wow! On our most recent stay we were regularly joined by managers and staff for a quick chat in the lounge before dinner, and post-dinner drinks at the bar are always fun: swapping great music playlists and wildlife photography tips with the bartender John, and getting tips from the local staff on where to ski the next morning. We were even joined by the owner Jeff at dinner one night, who shared hilarious and colorful stories about the history of the Rustler and Alta in general. At first glance the Rustler can look a bit industrial in places (it's built to withstand a major avalanche...), but the overall vibe is warm, relaxed and welcoming. 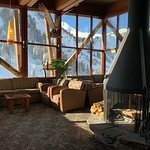 It's the real deal that skiers from all over hear about when discussing Alta: An authentic skiers lodge where the guests and the staff all share a love of serious skiing at a serious mountain. 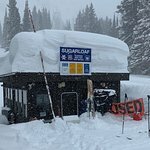 It's a bit expensive but utterly unpretentious and always welcoming, whether you are there to reconnect with a group of good...I just returned from my 4th annual "guys ski trip" to Alta and the Rustler Lodge and our affection for the place and the people there keeps on growing. The personal service says it all: on the first day of our first visit four years ago the guy at reception offered to lend me his personal ski pants and jacket when he heard the airline had lost my luggage - wow! On our most recent stay we were regularly joined by managers and staff for a quick chat in the lounge before dinner, and post-dinner drinks at the bar are always fun: swapping great music playlists and wildlife photography tips with the bartender John, and getting tips from the local staff on where to ski the next morning. We were even joined by the owner Jeff at dinner one night, who shared hilarious and colorful stories about the history of the Rustler and Alta in general. Hi Dave, I had a great time with you guys too. When you make your next reservation, make sure the reservations' girls inform me as to your dates ahead of time so I can make contact with you in Alta. Say hi to Urie and Ken. I look forward to seeing and the Colgate boy next trip. Alta is an incredible ski mountain, with "the greatest snow on earth," and Rustler makes for an absolute DREAM trip. It has become an annual addiction for me and several friends (early 50's) - the dopamine release starts with just thinking about returning the next year. The Rustler is, quite literally, one of my very favorite places in the world - the rare respite from the freneticism of modern, internet-obsessed life. The property ambiance that would be impossible to replicate and has been carefully cultivated over the years, with an obsessive attention to detail, by owner Jeff Anderson and key long-tenured staff: Tauni in reservations, Rebecca, Jackie and Sheridan smiling & chatting with guests everywhere and John who has been running the bar for nearly 3 decades (carefully curating a great 'Funk Jazz' play list). All are fabulous and make returning to this property a truly unique and welcoming experience. I've been back 4 times since my original review "Old School Idyllic" (2/27/16) and I can't imagine a year passing without returning to the Rustler. There are only 2 other properties that meet that same threshold for me: The Fairmont Kea Lani on Maui and The Carmel Valley Ranch...it is a VERY high bar. All share the characteristics of a unique property in a fabulous location with broad range of amenities and tenured, welcoming staff. 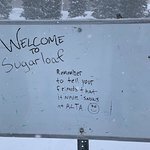 I hesitated to write this review, simply for the same reason for this sign at the Sugarloaf lift (after a foot of fresh powder): "Remember to tell your friends that it never snows at Alta." I decided to write the review because Jeff & the staff deserve all the accolades. Be forewarned though - the Rustler+Alta is addicting.